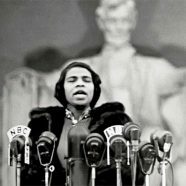 1939 – Singer Marian Anderson sings at the Lincoln Memorial in Washington, DC. Anderson, an international renown performer was described by Italian conductor Arturo Toscanini as “a voice such as one hears once in a hundred years.” Despite such admiration, racism in the United States still impacted her ability to perform. Anderson sought to perform at Constitution Hall, the top musical venue in the nation’s capital, but was denied access on the basis of her race. Constitution Hall was owned and operated by the Daughters of the American Revolution and when they shunned Anderson, First Lady Eleanor Roosevelt and many other prominent women quit their membership in the organization and worked to arrange for Anderson to perform a free concert in front of the statue of Abraham Lincoln. Introduced by Harold Ickes, the Secretary of the Interior, she sang a variety of songs, including “My Country ‘Tis of Thee” in front of a crowd of around 75,000 people. For more information on Marian Anderson, see her profile at greatblackheroes.com.